Tired of pub keno? Can’t be bothered heading to your local newsagency to make your keno picks? Consider playing Keno Deluxe, an online keno game that allows you to play for real money from the comfort of home. Find out more about this vibrant keno variant and where you can play Keno Deluxe on the Web using Australian currency. Keno Deluxe follows the traditional keno format, but gameplay has been jazzed up using bright, pastel colours and a fun controls board to make it much more visually appealing than the keno you find in your local pub or newsagency. 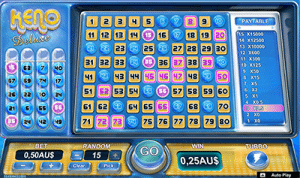 Like regular keno, Keno Deluxe consists of a grid of numbers from one to 80 and the aim is to pick up to 15 numbers in the hopes that these will match the winning numbers drawn from the pit. No special skill or previous knowledge of keno is required to play, making this suitable for newbies and seasoned players. If you’re feeling like you need to brush up on the rules of the game before you play, check out our handy new players guide. 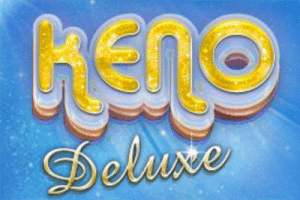 Keno Deluxe is available for free and real money bets at some of the top-rated online keno sites. It is an instant-play game, so you can play Keno Deluxe directly over your Web browser without having to download any special software. You can also select the ‘demo’ option on Keno Deluxe to play it for free in practice mode before committing to a real money wager. 1. Use the plus and minus buttons alongside the bet button at the bottom of the screen to select the value of your wager. Your betting options are $0.20, $0.50, $1.00, $2.00, $5.00 or $10.00 per game (unless you have VIP status at an online casino in which case you may be privileged to a maximum bet of $20.00 per game). 2. Click on the game board to select between one and 15 numbers. Alternatively, you can have the computer pick numbers on your behalf – just use the plus and minus symbols to select how many numbers you want to pick then hit the ‘random’ button to have them determined for you. 3. Click the ‘go’ button to start the game. If you want the results extra fast, just hit the ‘turbo’ button. 4. 20 winning numbers will then be drawn at random from the pit and displayed at the side of the screen. Any winning numbers that you match will be highlighted in gold, with any wins automatically credited to your account. How much can I win playing Keno Deluxe? When playing Keno Deluxe, the amount you can win depends on two things: the size of your bet, and how many numbers you have picked. The more numbers you pick, the more hits you’ll need to get in order to score a win. On the flip side, the more numbers you pick and match, the more money you will win. For example, if you only pick five numbers, you’ll only need to match one number to place a win, but if you pick 15 numbers, you’ll need to match at least three numbers to win. Picking only five numbers will give you a maximum win of 50x your bet if you match all five, while picking the maximum of 15 numbers and matching them all will earn a jackpot win of 15,000x your bet. All sound a bit confusing? Never fear – every time you alter the size of your bet or the amount of numbers you pick, look to the left hand side of the screen, as the paytable will automatically update to suit your wager, so it will always be clear how much you stand to win. The only real strategy to consider in Keno Deluxe is how many numbers to play. Each game will cost you the same amount whether you play two numbers or all 15, so optimal keno strategy recommends you play as many numbers as possible in order to increase your chances of a win. Other than that, Keno Deluxe, like all other keno variants, is a game of luck and there’s nothing a player can do to alter the outcome. Always bet within your means and remember this is a game of chance and just kick back and enjoy.